It’s been well over a month since I’ve posted anything, I know, I am so ashamed! In my defense, I really meant to! Really I did, but June was a fantastically busy month for me! I catered the biggest event in my career to date and it went FABULOUS! My clients were happy, their guests ecstatic, my staff was well paid and I proved to myself I could handle such a big crowd. Happiness all around! My birthday also happened, I’m officially in my mid-thirties. I think I just gagged saying that. Mid-thirties, I’m no longer a spring chicken *sigh*, I age pretty well, as in I don’t usually mind my birthdays, but when it’s significant, I start to remember that I am not as accomplished as I wish at this age. I suppose it’s just more incentive to make more goals happen so I don’t feel this way on my next birthday. I took a nice birthday weekend trip to Vancouver Canada to visit family, it was so awesome! I’ve been mostly sober (by choice and by mostly I mean I give into the occasional mimosa during brunch) since 2004 and almost 10 years later, I drank. I really drank with my cousins during one of our nights. I think I did about 6-7 shots of tequila. Luckily I was sipping on a lot of water the whole night so no hang over the next morning. SUCCESS!! My Aunt threw us an awesome family bbq and I was too busy socializing and didn’t get as many shots as I desired of the food or the cooking process. GAH! One of my main goals for the trip was to capture my Aunt in the kitchen because she really is a fantastic cook. I guess I’ll just have to plan another trip up! So that was June, I spent most of July trying to recover from June! During my recovery process, I got a little sick and that turned into extreme laziness and subsequently ignoring this blog for a better part of the month. I have no idea how far behind I am in my 52 Weeks of Blogging challenge, but I’d better figure it out soon and make up for lost time! I still cook, even if I don’t take picture or blog, I still actively make meals for the family. 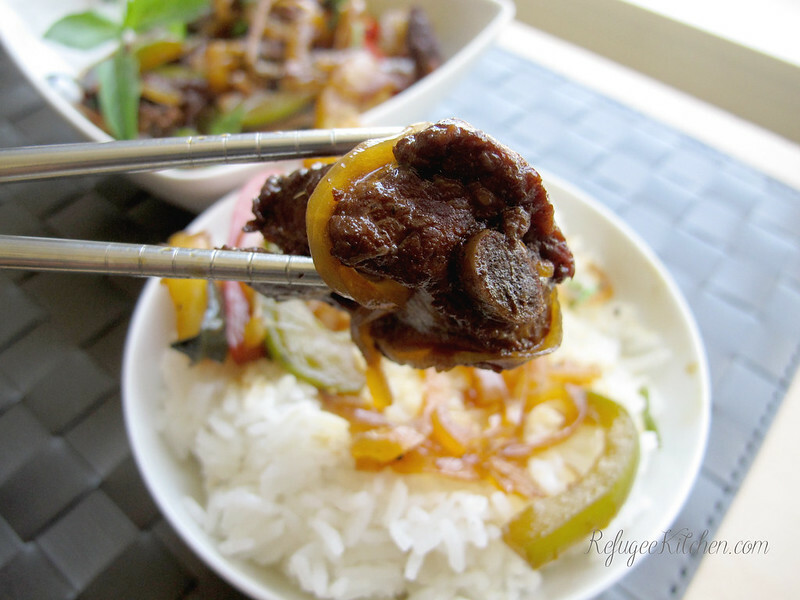 Recently I made stir fry short ribs with veggies for Sunday dinner. I took a quick picture before everyone dug in, posted it on my Instagram and meant to blog it but mostly I forgot about it. It wasn’t until InstaKhmerFood reposted it with a blurb about my blog that my IG and my site blew up! So much love to InstaKhmerFood for that. Of course now that I have a few more followers, I gotta get off my bum and actively post! I remade the recipe for dinner tonight so I could document it properly. Let’s do this! 4. Don’t worry about the brown bits, that’s flavor! Reduce heat to medium, add a bit more oil of needed. 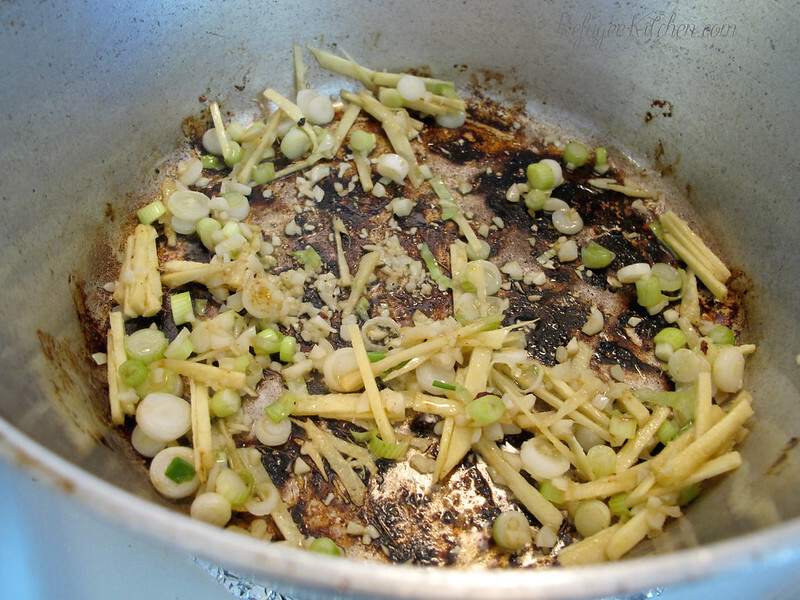 Saute garlic, ginger and whites of scallions until fragrant. About 1-2 mins, careful not to burn! 5. 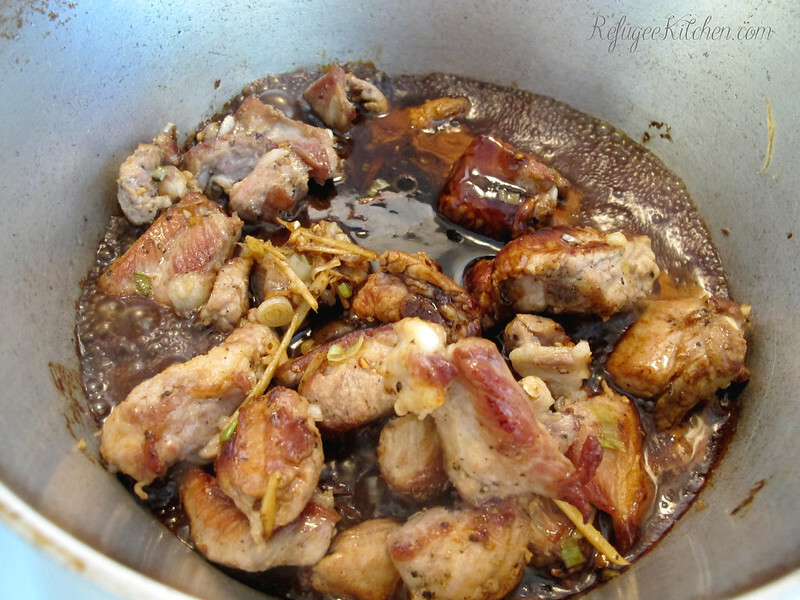 Add pork back to pot, add sauce and bring to a boil. 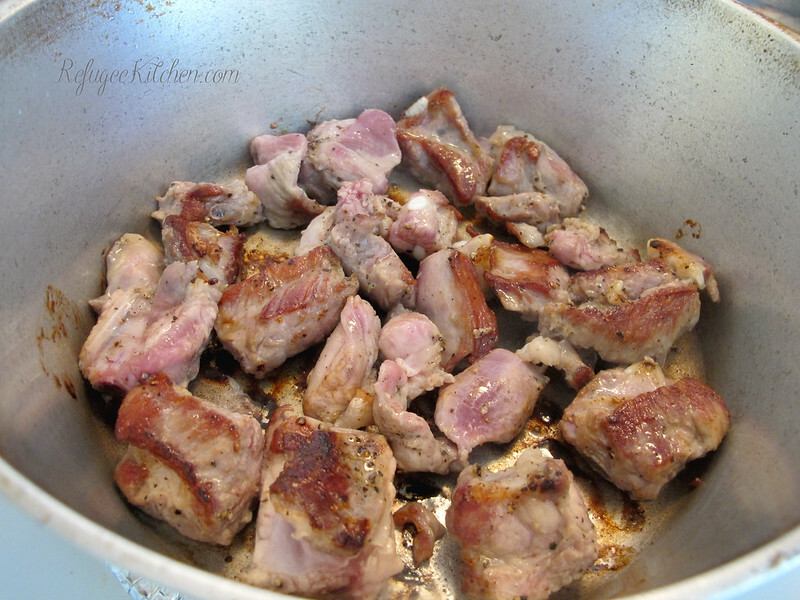 Reduce to simmer and let ribs simmer for 15 mins or until tender. 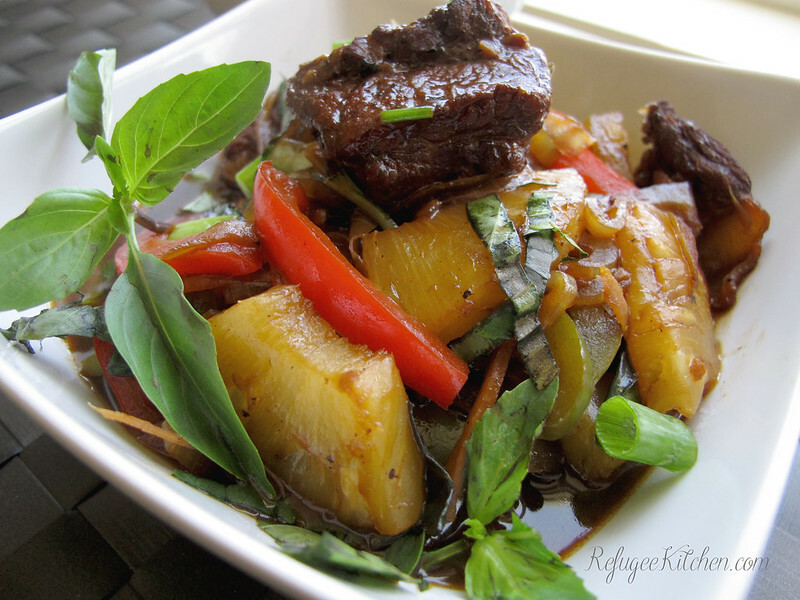 If sauce evaporates too much, add more water or pineapple juice. 6. 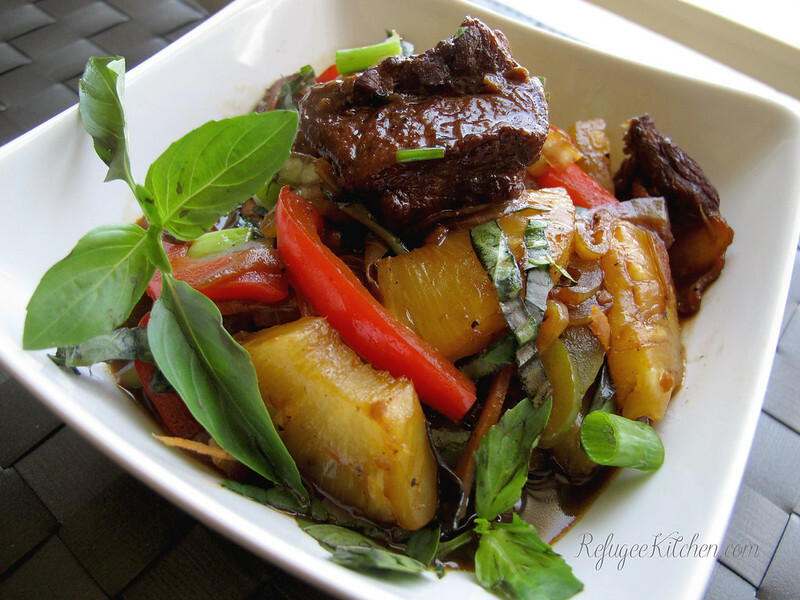 When ribs are tender, add onions and bell peppers. Toss until onions start to turn translucent and peppers are tender. 7. Add pineapples and if you choose a corn start slurry to thicken the sauce. 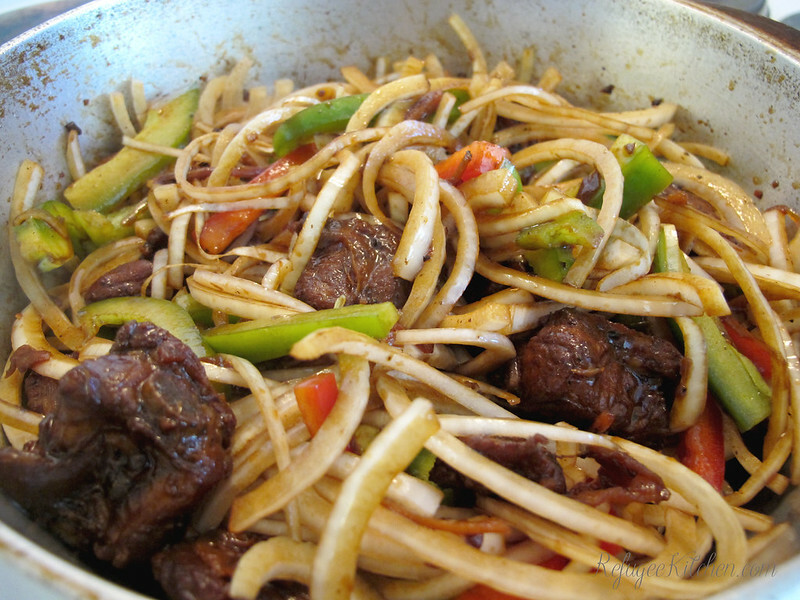 I went sans slurry, I like the stir fry liquids for my rice! 8. 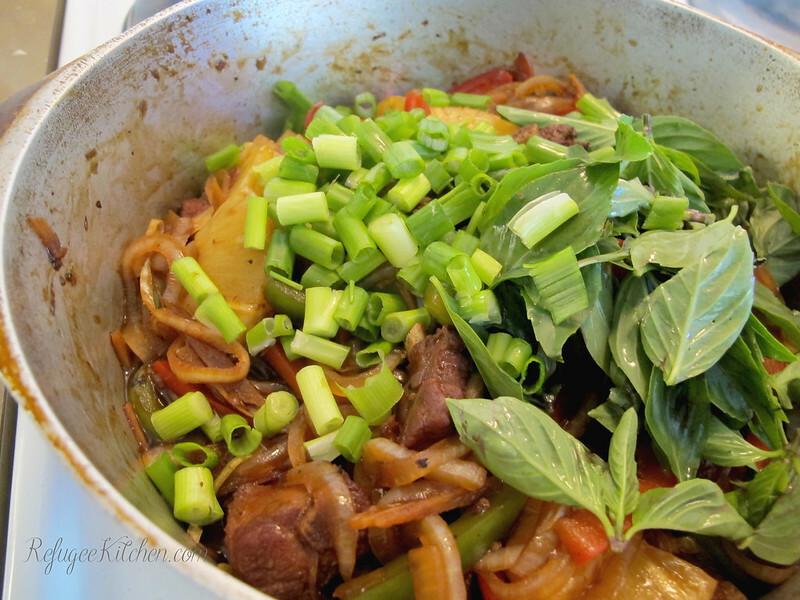 Turn off heat and add basil and scallion greens. 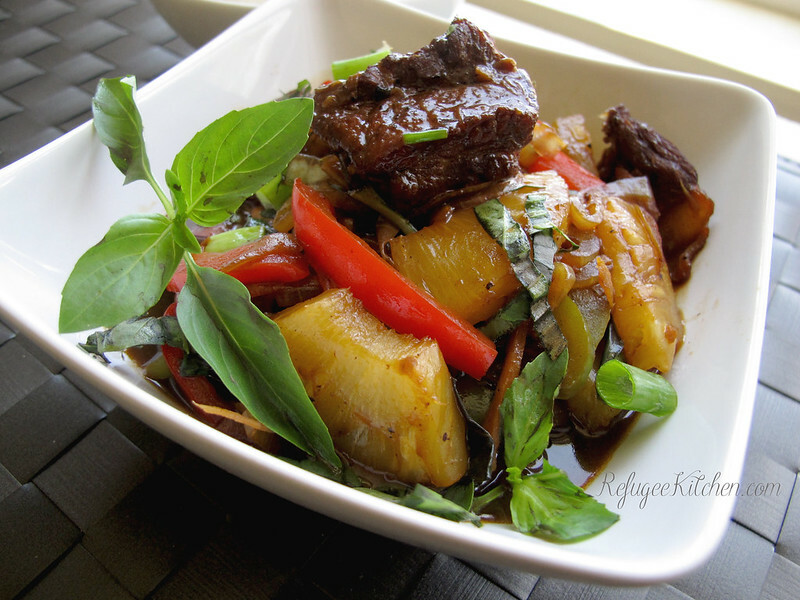 Toss once more and serve with hot steamed Jasmine Rice. 9. Bask in the glow of your appreciative family.